It is satisfying to take part in the preservation of artwork, particularly working as a conservator. We can and most often do reverse the damage caused by fire, soot, water and accidental damage. However, many of our clients have asked how they can do a better job safeguarding their artwork from future damage and catastrophe. A very good question, indeed! No one wants to expect a disaster, but disasters do happen. While it may be nearly impossible to predict a fire or flooded home, there are some practical things you can do right now to keep your artwork in stable condition. Lets start with the basics! Control of temperature and relative humidity is critical to the preservation of all types of artwork. Unacceptable levels of temperature and relative humidity can significantly contribute to the degradation of the materials used in the production of art. Humidity and temperature are a combined concern because temperature fluctuations can cause condensation of humid air, turning it into liquid water. Water promotes chemical reactions in artistic and commercial building materials both, such as; hydrolysis, fatty acid exudation, salt formation, and blanching (trapped water). It can also promote degradation in laminar materials, causing them to separate and detach. Laminar separation of one material from another (cleavage) can be seen when a paint layer begins to crack and flake away from the substrate canvas or wall. Depending on the artistic medium, material reactions will vary. True fresco murals, for example, are one of the most durable art forms invented. 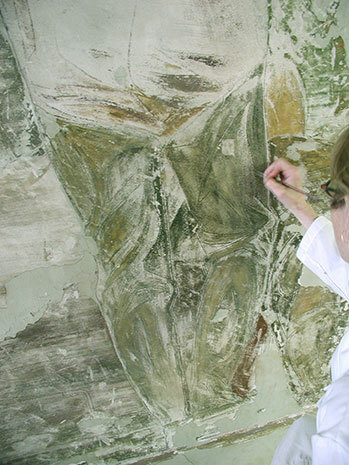 Frescoes are made by brushing raw pigments (in water) directly into drying plaster. As the plaster dries, it carbonizes, embedding the pigment as an integral portion of the wall. But the success of permanence is also dependent upon the success of the artist’s technique. Whole fresco murals have been known to deteriorate quickly because the drying rate of the plaster outpaced the artist’s application of pigment, for example. Frederico Lebrun’s Depression era postal murals in the Farley Building, NYC met such a fate as his assistants struggled to keep the walls wet enough to accept pigments. Within a few years, the mural failed, with pigment literally powdering off the wall. While no environmental controls can safeguard a poorly executed fresco from certain demise, a stable environment equates to stability in the materials of the artwork. The frequent recommendation is to maintain an environmental temperature of no more than 70°F and a stable relative humidity between a minimum of 30% and a maximum of 50%. The controls should remain constant 24/7. They should not be shut down at night or on weekends. Again, rapid temperature changes may cause condensation in the environment. In such an emergency (such as a power failure) gradual acclimatization of the environment is recommended. While it may be difficult for some to maintain perfect environmental control where their artwork resides, the cost of investing in an HVAC system with humidity control may be far less than the cost of future conservation treatment to repair damage caused by poor climate. Light is radiant energy. As such, it can generate heat and promote damaging photochemical reactions in art. It has been suggested that low light levels over a long period of time can cause the same amount of degradation as intense light for a short period. Light damage is often irreversible. Certain pigments and inks are more light sensitive than others. Light exposure can lead to premature fading and degradation of color. The most damaging portion of the visible light spectrum is the ultraviolet wavelength. The strongest UV light source is the sun. It is very important to keep artwork out of direct sunlight both for the heat it generates and because of the harmful UV exposure. Most incandescent bulbs emit less UV than fluorescent bulbs, probably because most of their energy is wasted as heat. Compact fluorescent bulbs (CFL's) will emit from about 50-150 microwatts per lumen of UV. If you are going to use fluorescent bulbs, a museum rule is that they must emit less than 75 microwatts per lumen, (most incandescent bulbs emit around 75 micro-watts per lumen). The trend in the last decade has been to use halogen bulbs, as they emit less UV light than incandescent standard bulbs. One of the popular brands of halogen bulbs for museum lighting is Solux. Additionally, the lighting designers at Solux will help you position the fixtures in the room. If you call them with the geometry of the room (ceiling height, artwork dimensions, etc) they will give you the recommendation for spacing. More recently, advances in LED lighting have also made them a viable choice for museum lighting. The Getty Conservation Institute has been conducting research on the subject. To receive a free lighting guideline from the Getty, click here. It is a good idea to check the artwork periodically for physical damage. Perhaps once every 3 months, artwork should be visually inspected for anomalies. Photographs should be taken and kept on file for visual comparison. If something looks out of place, or if there is obvious damage, such as water streaks, flaking paint, paint-loss, scratches and/or abrasions, contact a professional conservator. Over time, dust and other particulates may accumulate on the surface of painted artwork. While it may be tempting to use a feather duster or rag to sweep away dust, this can lead to a disastrous consequence if sections of the painting are unstable. Additionally, small particulate accretions of less than 1 micron in diameter will bind to paint molecules through hydrogen bonding. This particulate is so small you would never see it in the air, nor can you filter it out of the air. This particulate is the reason some paintings appear to be almost blackened with dirt after 70 years. No amount of mechanical action or cleanser will break the hydrogen bond, however. It can only be done through complex chelating chemistry that should only be attempted by a competent conservator. Well meaning but ignorant attempts at cleaning have left many artworks in worse shape than if they had never been touched. Dirt and dust accretions between 2 and 10 microns (dust bunnies) should also be periodically cleaned by a competent conservator. While seemingly innocuous, dust can act as a compress, trapping moisture and exacerbating the effects of relative humidity on the materials of the artwork. One of the more exciting answers to the question of safeguarding your artwork comes from our partners at DPR art rescue (www.dprartrescue.com). DPR has invented a service that goes beyond the environment by looking at disaster preparedness. For a fee, clients can have a schedule of their artworks catalogued for immediate evacuation in case of emergency. This streamlined service includes crates that are made well in advance of any disaster, so they can be ushered to safe storage (in the case of an impending flood) or whisked to a conservator for immediate emergency stabilization. This service is gaining such popularity, museums and insurance companies alike are asking for it. It’s a smart move by all parties to limit potential damage and save money in the process. Some insurance carriers even offer a premium discount for having a disaster plan. Its worth looking into. Call DPR at 888.377.5669 for more information. You may call Parma Conservation and ask for a recommendation, anytime, free of charge. 312-733-5178. By Peter Schoenmann, Parma Conservation, Ltd.